This week the EU Commission published its report (PDF) on responses to the public consultation on EU copyright held earlier this year. The consultation had drawn a comparably high number of responses with a total of about 11,000 messages, not least due to initiatives such as fixcopyright.eu (targeting end users) and creatorsforeurope.eu (targeting authors and performers). While over at IPKat copyright buffs are already delving into the details of the report, I tried to have a look at the bigger picture here: what do we learn about the state of copyright at large? And what overall direction should copyright reform take? With regard to both questions the report is quite instructive because of its clear and straightforward structure. The report is structured along the 80 questions of the consultation, which are distributed across 24 issue sections. 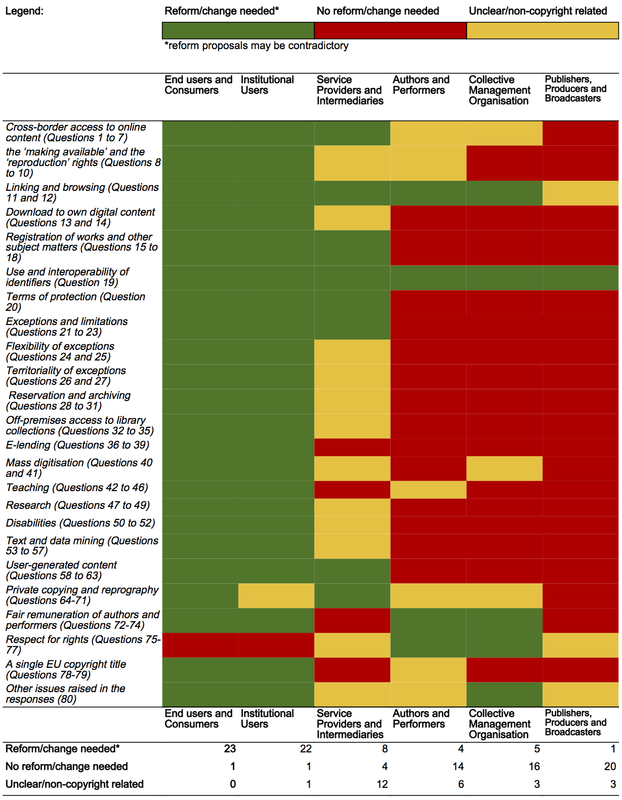 Within each of these issue sections, the report distinguishes between the different stakeholder groups that took part in the consultation (see chart below). What I have done is to check for each of the 24 issue sections whether one of the respective stakeholder groups sees a need for copyright reform or is content with the current copyright system (for details check out a public Google spreadsheet with original quotes). 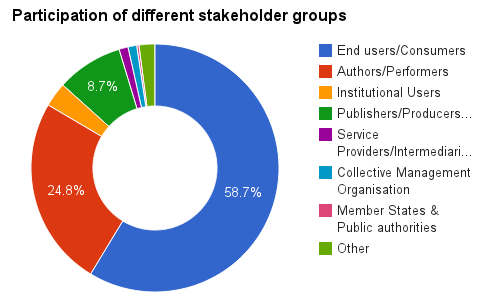 The results are not entirely surprising and very clear: we have a strong divide among copyright stakeholders with end users and institutional users (e.g. libraries, archives, universities) strongly in favor of copyright reform and authors, collective management organizations, publishers and producers in favor of the current copyright system. As I see it, the two charts above indicate that current EU copyright is very unbalanced. When one side is completely satisfied with the status quo and the other is very unhappy then this is not a balanced situation. Given that a good compromise should leave everybody equally unhappy, the results of the consultation also show the direction for copyright reform efforts of the new EU Commission: re-balancing copyright requires at least some reform as demanded by end users and institutional users, most importantly a more harmonized and flexible system of exceptions and limitations. The figures in this post and in the Google Spreadsheet are licensed under a Creative Commons Attribution International 4.0 license.